Learn to use the Sizzix leather cutting system and bead stitching to make incredible earrings. Learn several stitches and components to step up your jewelry making skills. A non-refundable deposit is needed to reserve your space or $20 of your class fee or coupon. All classes must be paid in full 24 hours prior to the date of the class. A 24 hour notice of cancellation is required or all class fees are forfeited. Call 210-490-7625 to reserve your space. This class will launch you into the world of table top soldering and sawing. You will learn the ins-and-outs of sawing different types of projects. You will also learn to saw, texture and solder an earring that I love! There are follow up classes that are for building your skills in metals and soldering. You can purchase a class for $60 or two for $50. The class fees for evening classes are non-refundable due to demand. Call 210-490-7625 to reserve your place and to check for availability. This is a one day intermediate level workshop. All stones, silver, supplies and tools are furnished for the class. You will learn how to solder sterling silver. 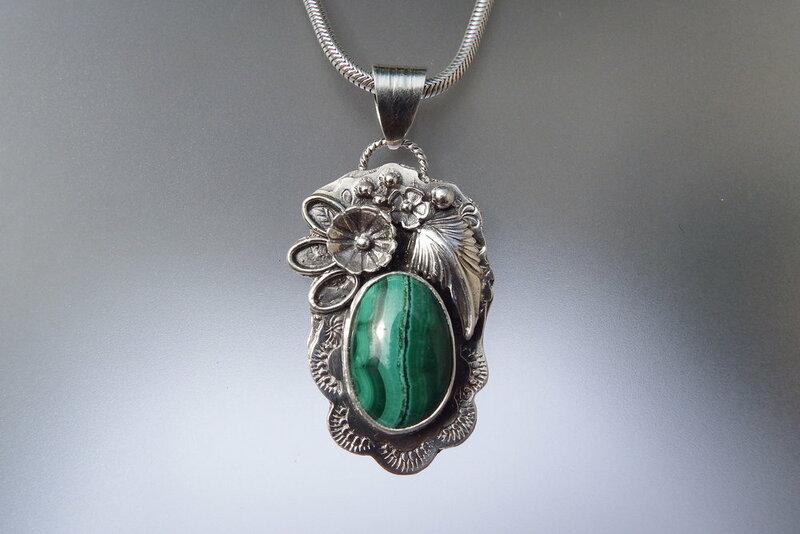 Learn to design a stunning pendant, make a bezel, solder it together, set the stone, and polish your project. We also learn to solder on various castings to decorate your pendant. This is not just a project class. You will be learning good basic skills that will allow you to make many different projects. We also have skill building skills in metals on Wednesday evening, please check the schedule. This summer fun flowers can be done in any color and is easy and fun. You can make a pair of earrings or a bracelet with this versatile component. Very simple to make yet so elegant to wear. A non-refundable deposit is needed to reserve your space. All classes must be paid in full 24 hours prior to date of class. 210-490-7625. $40 plus (kit estimate $15) * All levels * 3 hrs. 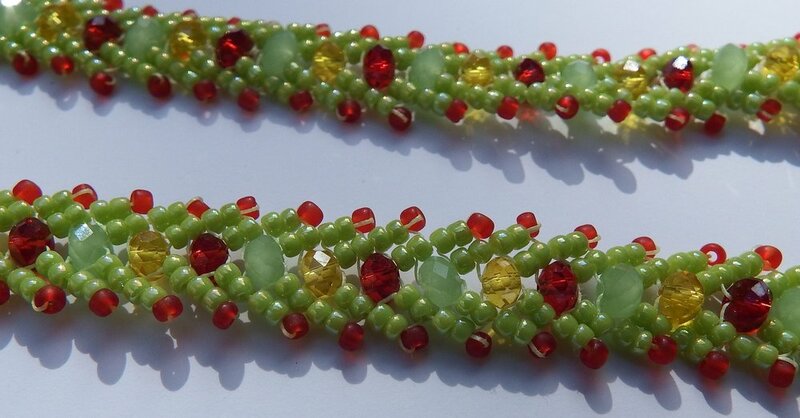 Learn this ancient Japanese braiding technique with many strands of seed beads or crystals. Learn the basics of how to solder. This class is the beginning class to a series of classes held every 2nd, 3rd and 4th Wednesday evenings and some weekends to build your metal-smithing skills. This class will teach you to form and solder metal with a hand held torch and how to work with tools to create stunning projects. Each class on Wednesday evening is a different project and is designed to build your skills in metals. This class has only 5 students, small and powerful! 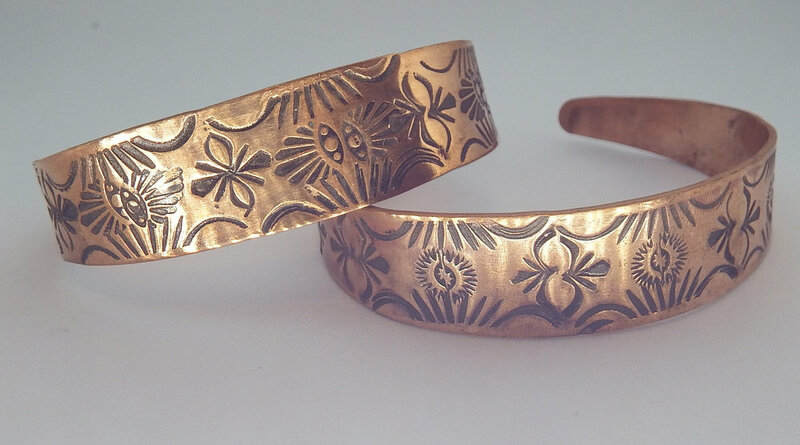 You will learn to solder, shape metal, texture metal and polish. Are you looking for something feminine? Lacy? This is it! Short lengths of an openwork weave are connected to small, hammered links and combined into a most delightful bracelet. Choose from 3 metals. The kits includes step-by-step, illustrated instructions. Kits range from $326up. The classes are very small and informative. Call 210-490-7625 to make your reservation. All classes must be paid in full in advance and are non-refundable. Orcs are creatures from fantasy fiction - but this openwork bracelet is fantastic to behold and wear. I have a solution to the challenge of building and controlling each unit as you link them together. Completion of several previous projects of increasing difficulty required. The kits includes step-by-step, illustrated instructions. Kits range from $35 up. This graceful and dainty bracelet will delight you! It combines elements of both the Double Spiral weave and the Byzantine weave. Notice that two of the options combine metals in different ways. It’s fun to experiment this way! Completion of several previous projects is required for this intermediate class. .The kits includes step-by-step, illustrated instructions, 2 main sizes of jump rings, and a coordinating clasp. Kits range from $23 up. Meet Marilyn at the book signing and have some fun! She will also have some awesome samples and many of her wonderful kits for sale! If you are looking for an awesome and substantial bracelet - this is it. It is round, dense, and sure to please. This weave combines elements of the Roundmaille and Turkish Roundmaille weaves. The skill level is intermediate and completion of several previous chainmail projects is required. Kits range from $24 up based on type of kit you select. This bracelet is a round, tubular shape that is bother understated and elegant. An exceptional toggle clasps completes the look. This weave is also perfect for making a beautiful matching necklace.Kits range from $43 up based on type of kit you select. Completion of several previous projects is required for this intermediate class. Students will learn the Gridbox weave, and review chain mail basics.The kits includes step-by-step, illustrated instructions, 2 main sizes of jump rings, and a coordinating clasp. Kits range from $27 up. This class is designed for the beginning jewelry artist. Make a single strand necklace and a pair of earrings. Learn many different techniques that will launch you confidently into the world of stringing and design in just a few hours. Learn from a dedicated instructor how to crimp, wire wrap, and more. Learn a delicate Saint Petersburg stitch and make a necklace or bracelet.Only two classes will be held on Thursday. Learn this classic Helm weave and launch yourself into the art of chain maille with this Scandinavian design. This is an easy class to begin your journey in chain mail. You can take small rings of wire and weave them together to make stunning jewelry. Kits are available in enameled or sterling jump rings. You will have easy step by step instructions in your kit. Please call 210-490-7625 to reserve your space.